Getting into the swing of this SOTA Activation stuff now. Time to earn a few more points! Three summits for the day. 31/08/2013 Mt. Donnabuang VK3/VC-002 Points 8 + 3 winter bonus. 20 contacts on 40 metres ssb including a S2S with VK1NAM and one contact on 12 metres SSB (VK3PF) Activation time 24 minutes. Mt. Toolebewong VK3/VC-033 4 points. I really had not thought much past Mt. Donnabuang for today. Had considered Mt. Little Joe but decided on Toolebewong as I had often driven past it traversing through Healesville. At this time of year, the more direct link road across the top via Don Gap was closed so it was back to the bitumen to launching Place then Don Road towards Healesville. Not far from Panton Gap I took Myora Rd that generally headed due south before singing to the east (a minor road called Chapmans Rd. continues straight ahead). Further on, Myora Rd does an abrupt turn to the south and at this point a minor road heads north towards the summit. I parked the van on the side of the road next to a farmers paddock and walked up as far as I could get towards the summit which is inside private land (with signs!). I set up along the LHS side of the road outside of the private property sign. Not a very inspiring place, no views and the best place for the squidpole proved to be the middle of a mud hole. 15 x 40 meter ssb contacts including an S2S with VK1NAM plus a 12 metere ssb with VK3AMB – practically line of sight. Activation time 15 minutes. The drive up from Healesville on Myers Creek Rd is straight forward although I was kicking myself for not re-fueling on Saturday. Needed a Pitstop before heading out. Vehicle access to Mt. 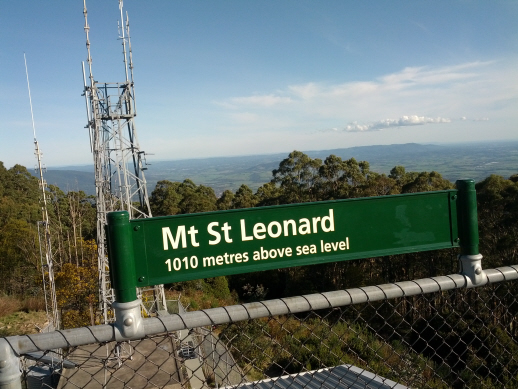 St. Leonard is from the gravel Monda Rd followed by a strenuous walk along a good road closed by a gate. This road initilaly follows the power lines to the summit before looping around the east and south sides so you actually walk right around the summit and approach from the north. I walked past the viewing platform and tower and set up at the southern most point. The noise levels were not too bad, certainly much lower than what I have to put up with from home on 40 metres..
Activation time 35 minutes. 11 contacts, being 2 x 12 metre ssb, 2 x 2 metre FM and 7 x 40 metres SSB.. A great view across Melbourne an just used the hand held with the standard antenna on 2 metres. 15/09/2013 Federation Range VK3/VN-003 Points 8 + 3 winter bonus. 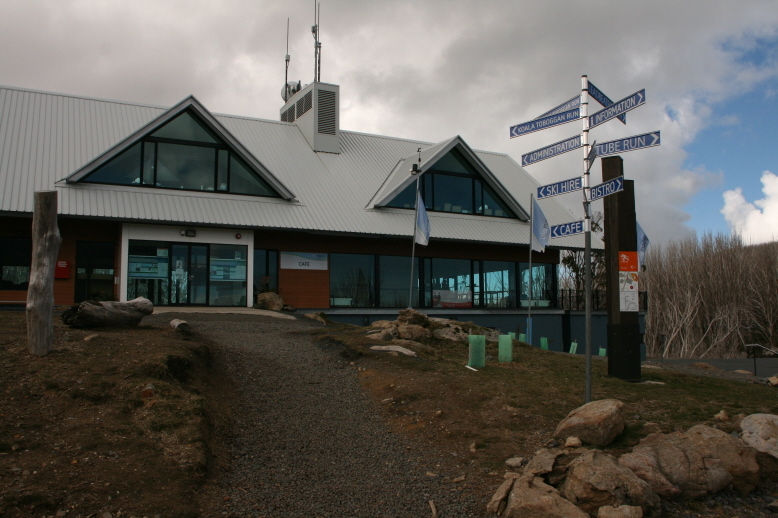 The snow season was over, No Entry fees for the Lake Mountain Gerratys car park. The Bistro was advertised as open So I thought I could do an activation and take Nan out for lunch? This summit has now been deleted. New summit under the same name is a few kilometres further north. The road is bitumen all the way to the car park. Toilet facilities and tourist information available. Should have checked the lunch menu! 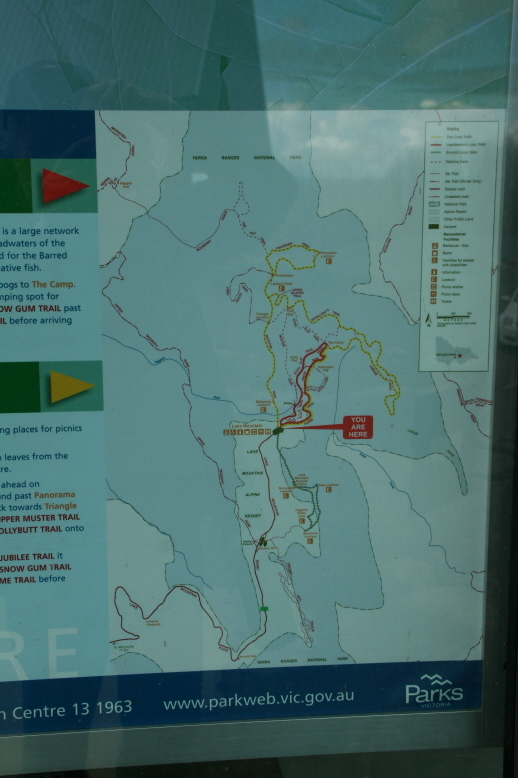 From the main car park, to make it a round trip we headed up Muster Trail then hooked town to the Triangle Junction on Royston trail where we set up inside the activation zone. WX was cool but the sun was out. A pleasant day out in the countryside. Nan took the picnic rug and set herself up down the track and fell asleep. Meanwhile, I managed 18 contacts including S2S with Glenn VK3YY (vk3/vn-016) on 40 and 12 metrres SSB and the highlight being the first VK to VK S2S CW contact with Warren VK3BYD on VK3.VC-019. The remaining 15 contacts were 40 metres SSB. A day out with my eldest son Lachlan (ex-VK3HOW). Access to this summit is quite easy. Due south along Snobs creek rd which is good gravel and then west on Number 5 track which is a good road. The winter alpine road closure starts just beyond the start of the Royston range track so we parked here for a quick coffee then commenced our walk. There is a lot of logging activity in this area. 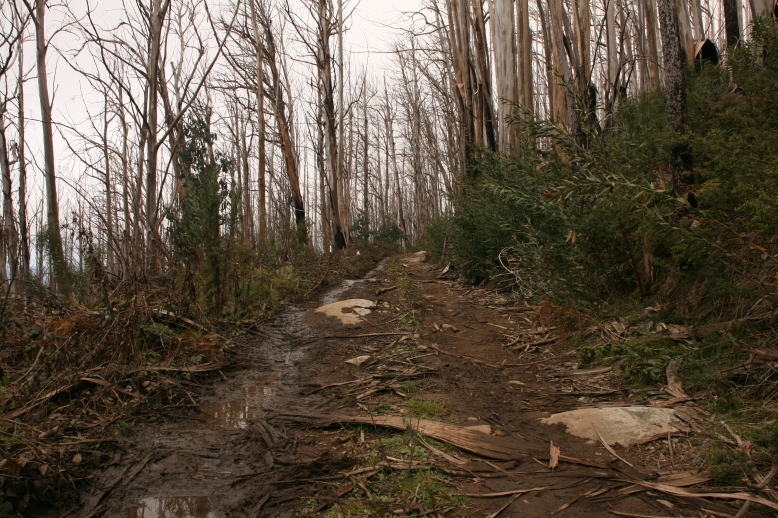 The Royston Range track follows the main ridge line once you have reached a large cleared area where a more major logging road with blockade continues straight ahead. If driving in summer, the Royston Range track is definitely 4WD only. ramid hill is in a large loooed area that was also burnt in the 2009 fires. 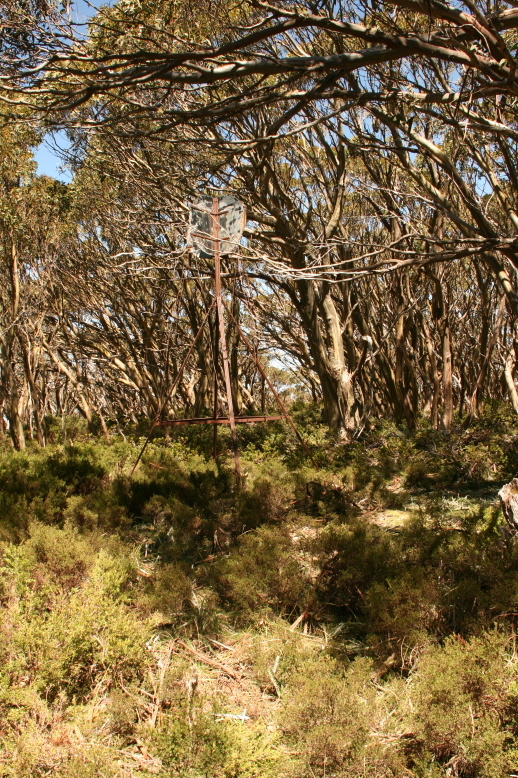 We set up anongst the rocks in the logged area just down from the actual summit. No Telstra Mobile coverage here. 26 contacts all on 40 metres SSB including 2 x S2S. Activation time 82 minutes. Back to the Landcruiser from near Pyramid Hill, we headed to Conns Gap track from the bottom of the Barnwall Plains Rd. Definitely 4WD this one, a steeper rutted muddy section had both dif locks engaged and the muddies spinning. Should have lowered my tyre pressures. We parked where the contours indicated we were 70 metres down from the summit and a relatively easy grade. Lots of logging and fire activity making progress a bit slow and difficult. We operated from a pleasant clearing just to the north of the actual summit. Lots of rocks! No phone coverage. 28 contacts. all on 40 metres SSB except for a CW S2S with Warren VK3BYD . Activation time 27 minutes. Back to the car for lunch, watch your steps with all the fallen timber! Heading to Bills Head21/09/2014 Mt. Duffy VK3/VN-007 6 points. After the scramble through fallen and burnt timber at Bills Head, Lachlan & I thought something easier for the next summit was in order. 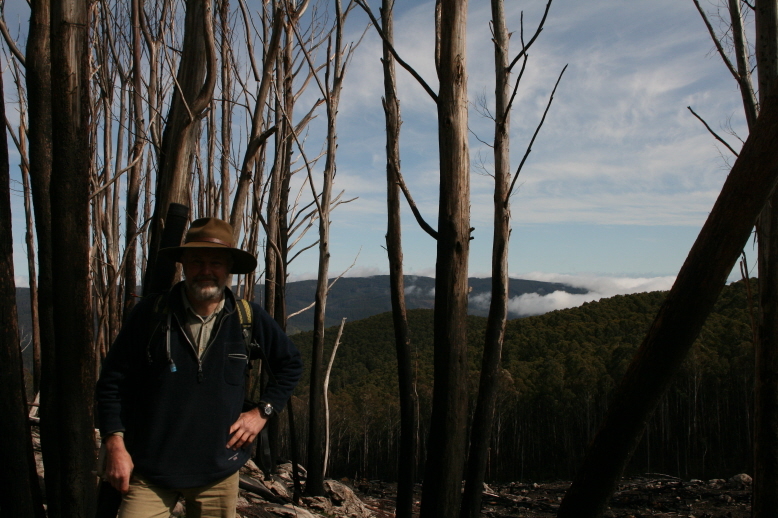 I was feeling a bit sore after a few falls from being tangled up in the timber and our proposed next summit – Keppel Ridge looked like it had a heck of a lot of logging re-growth – not fun! We followed Federation road and Rough Hill road(really a track) that took us directly to the Mt. Duffy trig point. We walked out and then back into the activation zone with our gear and set up. The squid pole was strapped to the trig marker. No phone coverage. 16 x 40 metre and 1 x 12 metre SSB contacts. Operating time 16 minutes. Loacetd off Dray track and due north of Mt. Duffy, we had time for one more following our quick activation of Mt. Duffy. Dray track is relatively easy 4WD but with some steep shale sections we used low range to avoid needing the brakes. Point 1025 is off Dray Track via Lookout Track that has some quite steep sections. FYI Mine track is not maintained and links back to Mt. Duffy via Kevins Track. Sabrinas track peters out further to the north and Lookout track continues down a very steep hil to a dead end where Point 951 VK3/VN-010 is located. Another time perhaps for that one! No phone coverage. We returned home back along Dray track to Mt.Duffy then Reefton Logging road, avoiding a very steep track dirtect to the Big River at Stockmans Reward, we followed an easier path to the south east comming out on the Big River at Vennells camp area. If in this area, there is no vehicle crossing or access to Catford on the Big River if coming from Mt. Duffy. With some fine weather forecast, this was the last opportunity to grab some winter bonus points. The drive to the Mt. Erica Carpark was straight forward and took two and a half hours from home. There are other walks from the car park plus a public toilet. The Alpine Walking Track is a steady and steep climb all the way to Mt.Erica which affords some views back over the Latrobe Valley. 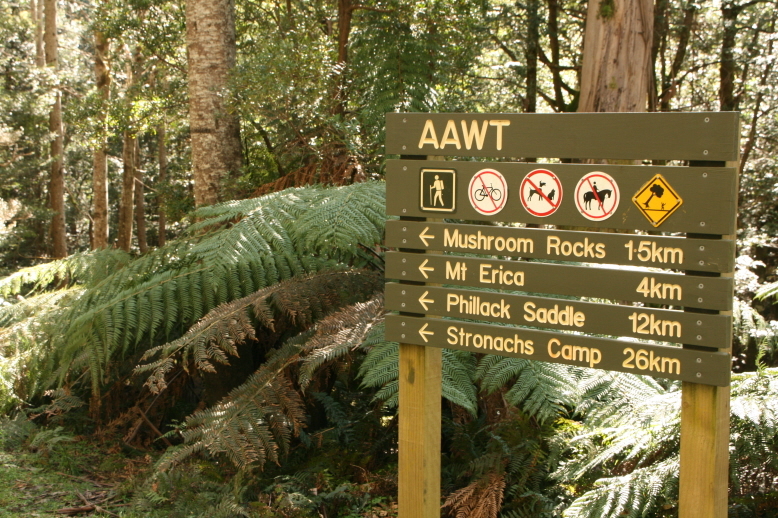 Mushroom rocks at the 2 kilometre mark of the 5 kilometre haul provides a pleasant diversion. 1 kilometer past the Mt. 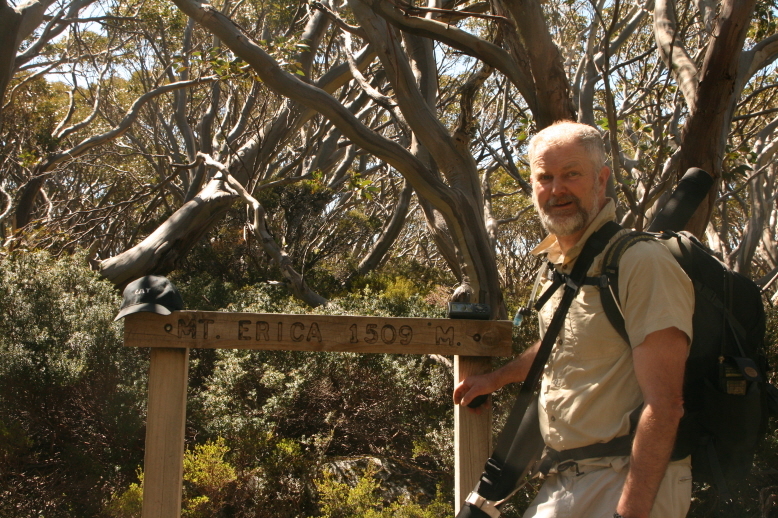 Erica summit and along the walking track is a detour to the Old Talbot Hut. A further 500 metres north along the Alpine Walking Track brings you to Talbot Peak (no views) off to the left hand side among some rocks. 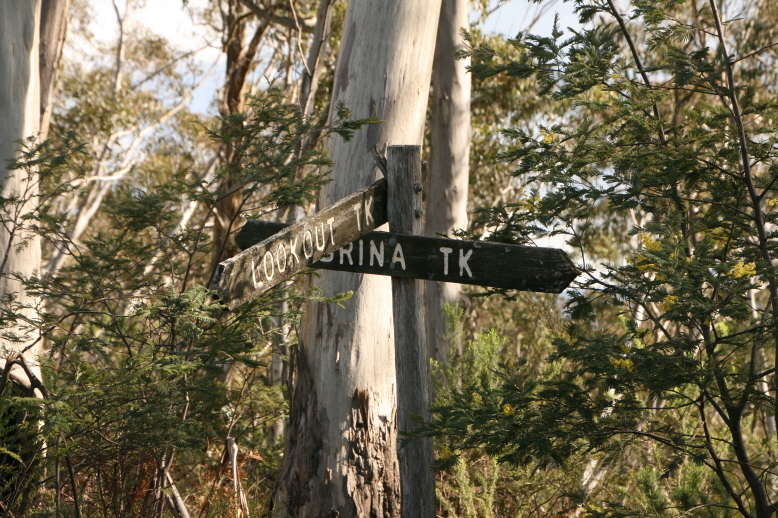 The Old trig marker is still standing. It took Nan and I about 3 hours to reach Talbot Peak with a lunch break at Mt. Erica. Much easier going back down! This brings an end to the 2013 SOTA winter bonus period. More summits and adventures are to follow.